I’m in soup mode again. 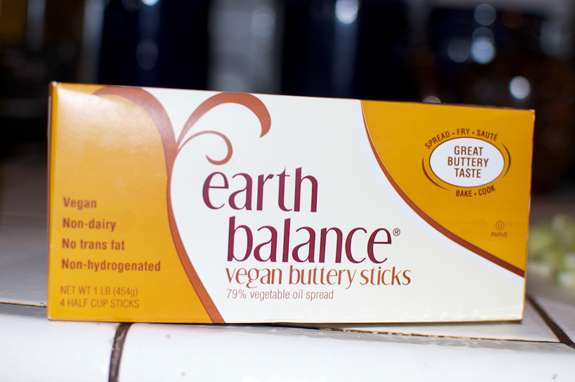 Considering my daughters and grandsons just devoured bowls of it, I think I should re-consider an apology. 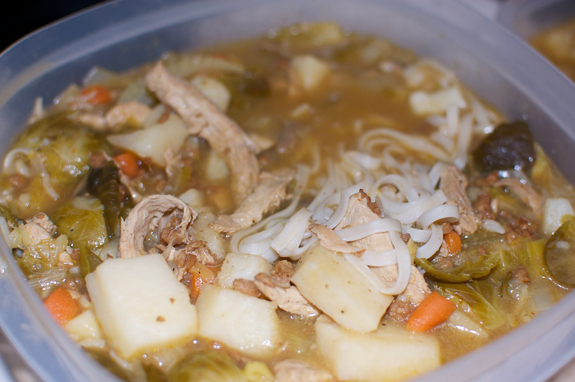 Truth is, I actually love having soup left-overs to take to work for lunch during the week, so I was super motivated to make another batch. 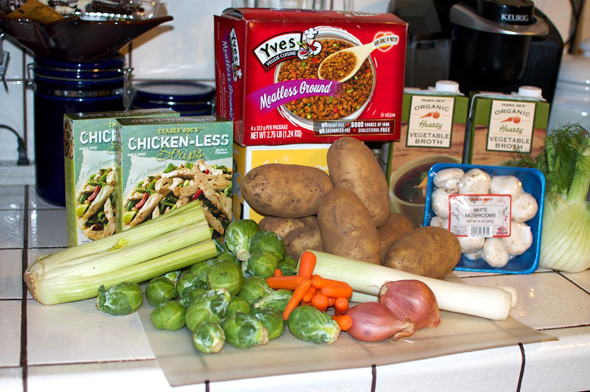 Since we had the kids over for dinner tonight, I made a pretty big pot – adjust amounts for a smaller crowd. 1. If you’re wanting to ladle the soup over rice, start your choice of rice in a rice cooker. I actually served some soup over rice and some over whole wheat soba noodles letting people choose what they would prefer. 2. 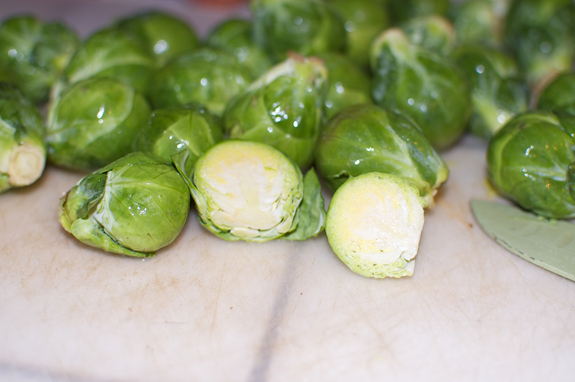 Pour vegetable broth into large soup pot, add potatoes, brussel sprouts and carrots and bring to a boil, then simmer. 3. 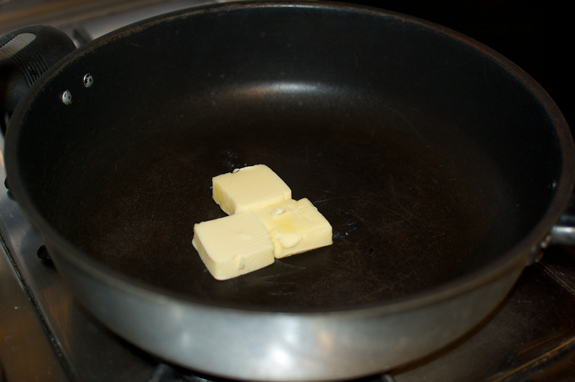 Over medium high heat melt vegan butter in a pan. 4. Add shallots and cook until translucent. Add garlic and stir. 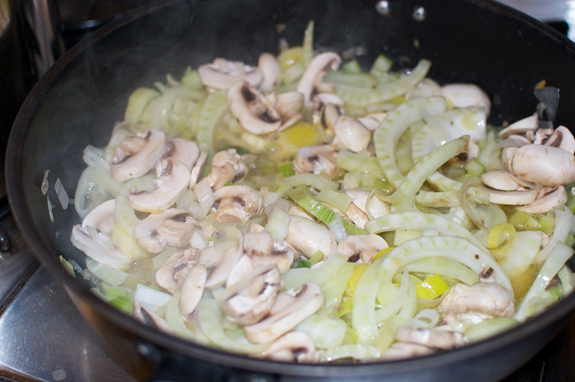 Add celery, fennel root, leeks and mushrooms. Stir and cook covered 5 minutes (when fennel is softened). 5. 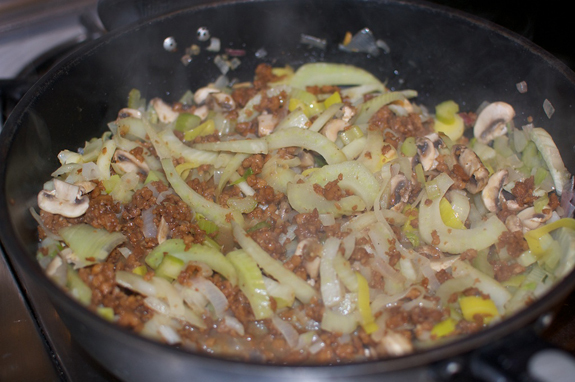 Add a cup of hot broth from soup pot (using ladle) and Yves veggie crumbles to pan and simmer 5 more minutes. 6. Ladle contents of pan into soup pot leaving a small amount of broth in the pan. 7. 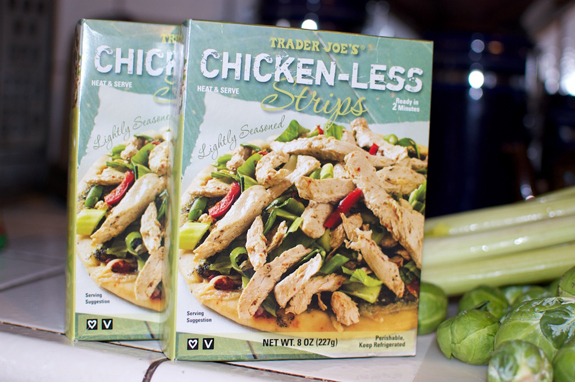 Add chickenless strips to broth and cook, stirring occasionally 5 minutes. 8. Sprinkle flour over strips slowly stirring together. 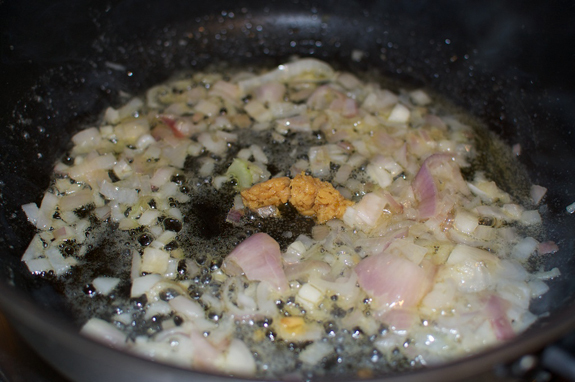 It coats the strips and adds some substance to the broth. 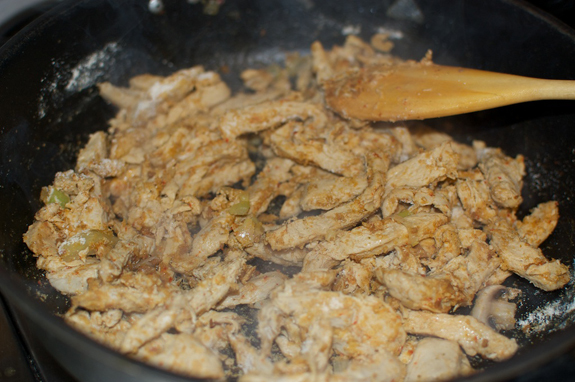 After mixed, add this to the soup pot and simmer. 9. Add salt and pepper to taste to soup pot. 10. 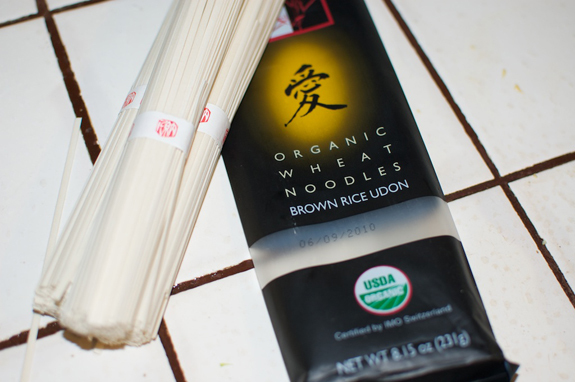 While soup is simmering, cook soba noodles if you’re using them. Here’s the variety I used cooked according to directions. 11. 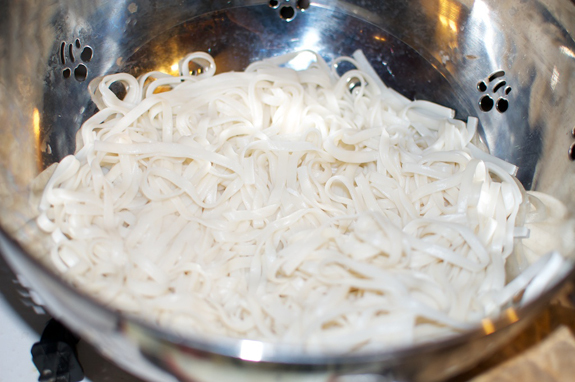 Put rice, noodles or both in a bowl, ladle soup on top and ENJOY! Hmmm…this one looks a bit more time consuming than the others you post! LOL! I am LAZY! Hi Erin, the best part about this recipe is that it made a ton of soup…for freezing and saving…aaaahhh the meal that gives and gives :) Happy Holidays!